Dell releases the first High performance screen flip and touch screen capable laptop, after the suspenseful Inspiron Duo netbook, the Dell XPS 12 is a 12.5 inch screen size featuring the latest third generation of Intel CPUs. 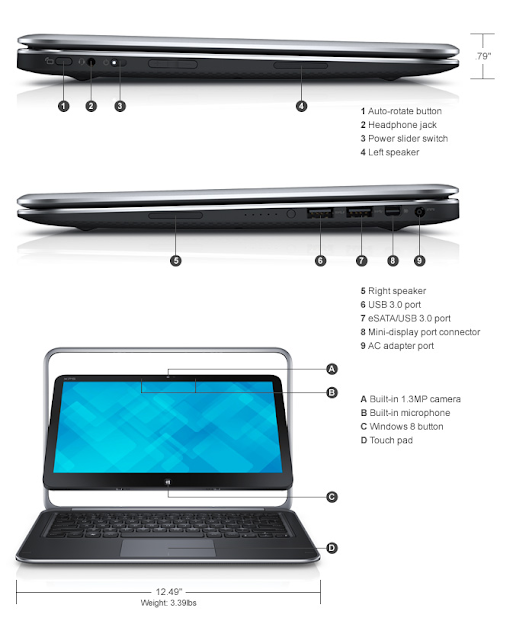 With the Multi-touch screen flipper, this laptop can easily converted into a big tablet PC with Windows 8 OS, and don't think about the durability of the screen, they tested the screen up to 20,000 cycles, that mean 10 flips per day, everyday for 5.5 years ! 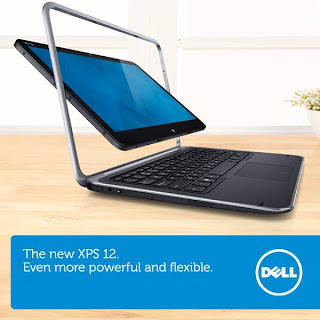 Specifications are 12.5 display screen capable of doing Full-HD resolution, the CPU inside is an Intel Core™ i5-3337U clocked at 2.7Ghz, powered with an Intel QS77 Mobile Express Chipset and the latest Intel HD 4000 graphics, 128GB of SSD for fast performance, the Dell XPS 12 is built using solid materials, a Premium carbon fiber for display back and base in addition to magnesium palm-rest with soft touch paint, the edges are rounded and hands friendly.